There is a lot going on in Blog-land today. 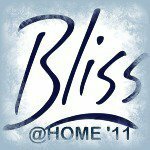 Blissdom is starting today in Nashville and there are many lucky bloggers heading there right now for a fun filled weekend. Then there is "For the Love of Blogging" going on over at sluiternation and notsuperjustmom. and of course there is Working Mom Wednesday at Work, Wife, Mom, Life. Talk about a full social calendar. So today I am going to be spreading myself way too thin in attempt to participate in them all. 1st Stop: For the Love of Blogging. Twitter has lead me to some wonderful things. This is no exception. Katie and Miranda, both teachers, have created this event for the bloggers not going to Blissdom. It's a wonderful opportunity to learn more about writing and network with some new people. I look forward to learning a lot from them and hope they can get past my sometimes poor grammar and misuse of the comma. You probably wouldn't know it from reading my blog, but I went to college initially to become an English teacher. Turns out that my rebellious side and my creative side don't always jive. I love writing but hate most of the rules of grammar, so when I blog I do my best. My hope is that when you come here you are so enamoured with my writing and loveable spirit that you'll forgive my sometimes misplaced punctuation. You can read most of my info in my About Me section. I've been blogging for a full year now and I started as a way to document my new life as a mother. Since then I have found that it's more of a creative outlet for me and a way to really channel my love of writing. I am still struggling to find my voice, but I love the sense of community blogging brings and I am learning more and more each day. I am in the process of streamlining this blog and my first one, Mama Insomnia, so I've been a busy girl these past few weeks! Julia has 2 great prompts up so I urge you to check them out if you are looking for some inspiration. I thought about which to write and came up with nothing for either. But I'm going to save the prompts at the back of my mind for a day that I need a little juice to get me going. It looks like you're going to have a busy day!!! I'm going to check out those misused words one by Miranda!! Good morning. Found your blog via Bliss at Home. I'm definitely going to check out that grammar post -- misuse of words drives me absolutely batty. Every time I see someone do that on Twitter I want to correct them but I resist the urge.